“Vortigauntlet” is a single player level for Half-Life 2: Episode Two which takes place during the main game’s campaign in the Nova Prospekt prison. 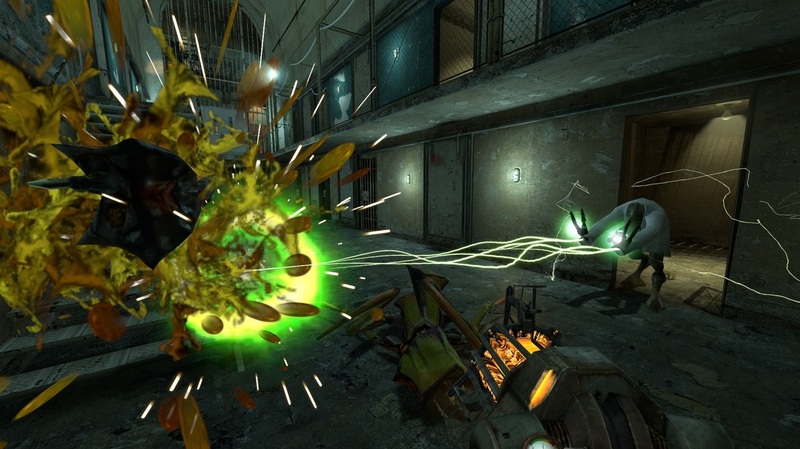 Players take control of Gordon Freeman to escape from their prison cell and encounter a Vortigaunt scientist, Vorgue, who requests Gordon's aid. 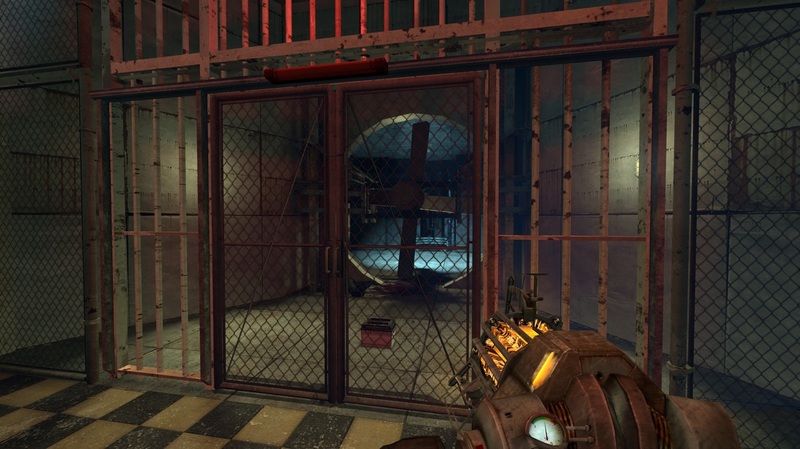 Before deserting Nova Prospekt due to the antlion infestation, the combine set up teleportation devices around the facility for testing on unfortunate prisoners. Vorgue explains that the door blocking the hangar escape route requires four power cells to open. Vorgue believes he can configure a teleportation device to exit at each of the power cells’ locations. However, he needs Gordon to enter the portal and search for the power cells so he can remain at the main terminal and operate the teleporters. 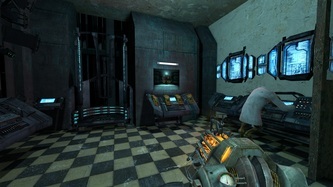 Players choose between four active portal destinations represented by a monitor display. 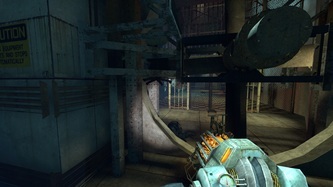 Players must combine the resources they collect from each of the four teleport destinations to ultimately escape the prison. 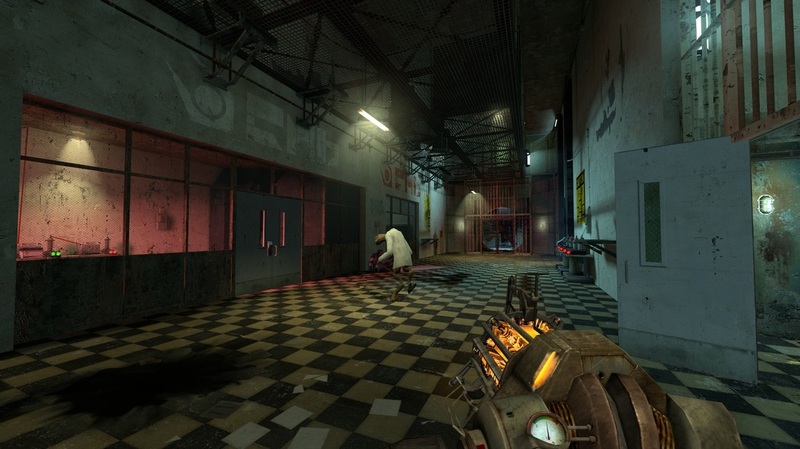 Vortigauntlet is the result of an assignment to create a small amount of gameplay that deviates from conventional Half-Life 2 content. In this "push the box" assignment, I was under the constraint of using the Gravity Gun as the only weapon. Collection Puzzle: After experimenting with Sources teleportation and monitor material functionality, I decided to create a single teleporter with multiple destinations which players could cycle through with buttons. 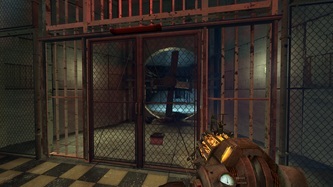 Players must use this device to reach previously in accessible areas and collect batteries to ultimately power one of the prison's exit gates. Visibility & Accessibility: I worked hard to ensure immediately visibility of all objectives and key objects even before they are accessible to players. 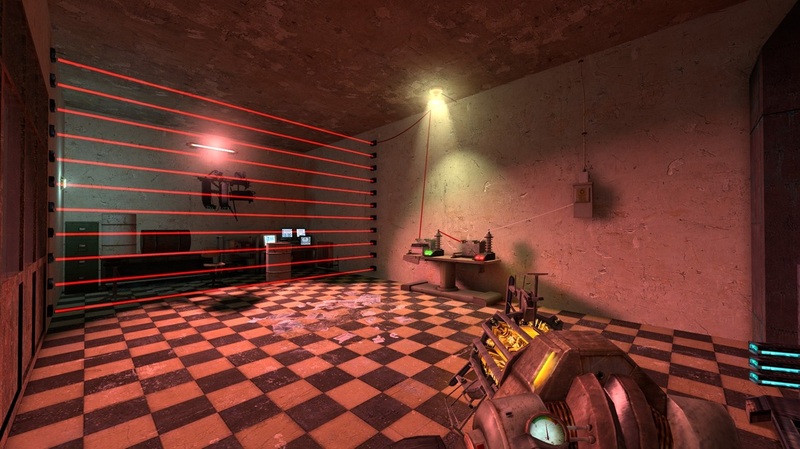 This ensured that players were never completely lost and could always see the objects they needed to be working towards and nearby relevant context clues. Reuse Space: "Vortigauntlet" was my first level using Source's Hammer editor. I was expected to create a small level with at least five minutes of gameplay in four weeks. In order to achieve this along with a high level of visual polish, I needed to build a geometrically small space with gameplay that reuses it. The semi-linear puzzle scenario that involves interesting revisitation of old areas with new tools achieved this. Navigate the slideshow using the numbers below. The numbers correspond with the locations noted on the map above. Refer to the captions at the top for a full walkthrough and click on each image to view it in high resolution. 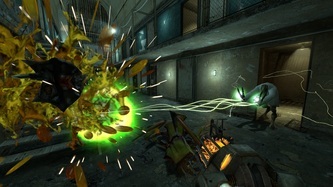 "Vortigauntlet" features a dynamic teleporter which players can configure to point to one of four destinations. A monitor above the teleporter's control terminal projects the selected destination in real time. 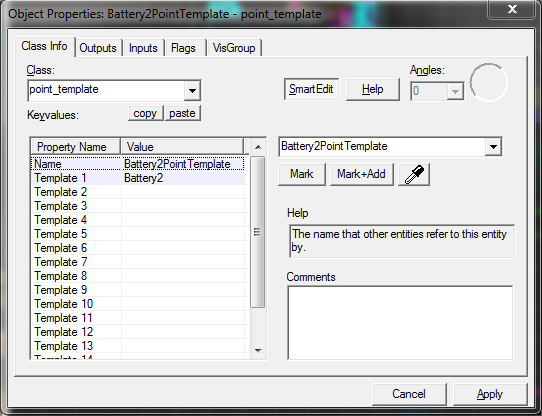 To accomplish this, I used Hammer's Input /Output scripting system. 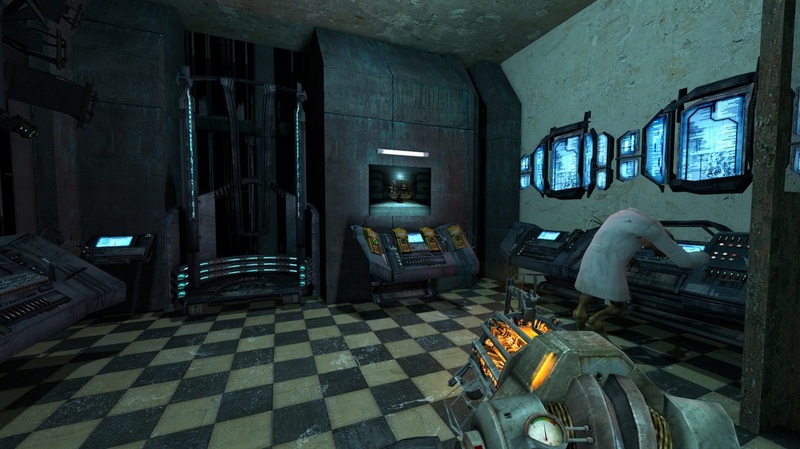 The Vortigaunt scientist prisoner, Vorgue, guides players to the teleportation device during the beginning of "Vortigauntlet". I used the 'Scripted Sequence' entity in Hammer to control his animations and the 'ai_goal_lead' entity to configure his behavior as an NPC that waits for and leads players to specific destinations. 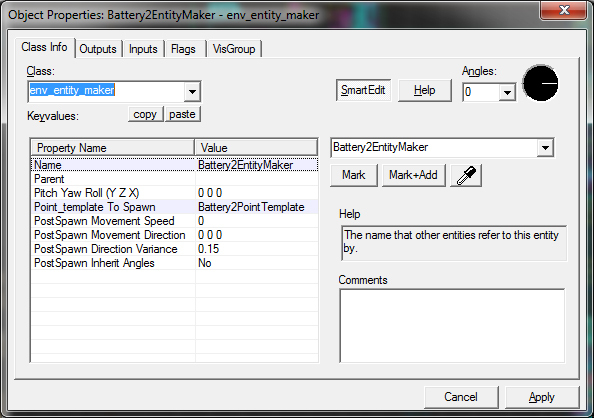 "OnOutOfWorld" > "Break" > "Battery#"
"OnBreak" > "Force Spawn" > "Battery#EntityMaker"
"Vortigauntlet" was my first map using Valve's Hammer editor. This preliminary map image represents the initial planning phase for the level. After spending more time in Hammer and familiarizing myself with its capabilities, it became apparent that I would not be able to implement the last area up to my quality standards under my time constraints. I removed the hangar area and implemented the catwalks in the main prison hall, making "Vortigauntlet" a pure puzzle and escape scenario. This was a bit of a blessing in disguise as it made all batteries and key objects visible from the main hall. Some folks in the Half-Life 2 community stumbled across Vortigauntlet and reviewed it.